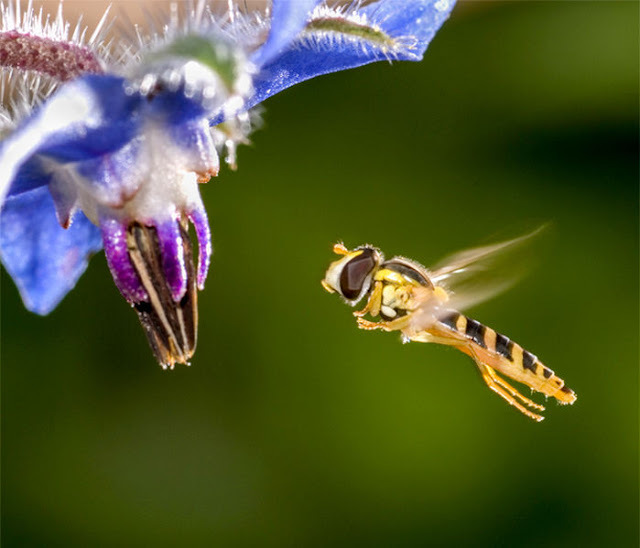 The Deliberate Agrarian 2.0: "The Windshield Phenomenon"
The hover fly is one insect I'm always glad to see in my garden. Entomologists call it the windshield phenomenon. "If you talk to people, they have a gut feeling. They remember how insects used to smash on your windscreen," says Wolfgang Wägele, director of the Leibniz Institute for Animal Biodiversity in Bonn, Germany. Today, drivers spend less time scraping and scrubbing. "I'm a very data-driven person," says Scott Black, executive director of the Xerces Society for Invertebrate Conservation in Portland, Oregon. "But it is a visceral reaction when you realize you don't see that mess anymore." Some people argue that cars today are more aerodynamic and therefore less deadly to insects. But Black says his pride and joy as a teenager in Nebraska was his 1969 Ford Mustang Mach 1—with some pretty sleek lines. "I used to have to wash my car all the time. It was always covered with insects." Lately, Martin Sorg, an entomologist here, has seen the opposite: "I drive a Land Rover, with the aerodynamics of a refrigerator, and these days it stays clean." Have you noticed the windshield phenomenon? In high school, I worked at my grandfather's service station, during the summer. There were two federal highways (before Interstates) that crossed in our small, southern, rural town and I can still remember the "mat" of mashed bugs that covered the front of those cars, traveling toward vacation spots in SC, FL and the Gulf Coast. From the bumper, to hood front, to the windshield, a solid "mat" of every kind of bug on those now "classic road warriors". Some owners would buy screen-mesh protectors for the front of the car to protect the finish and keep the insects from clogging the radiator. And yes, that conglomeration was a real challenge to get off. That's when I found out the "secret" of using CocaCola. It worked and worked well, but I couldn't afford to buy it as a remedy. Thanks, Herrick, for bringing up the Windshield Phenomenon. I currently live in a very rural area. My job had me driving about 300 miles a day. My van was so thick with bugs, I used to tell people that if everyone drove a Ford van, many bugs would be extinct in a few years. These days I seldom drive faster than 30 miles per hour. (No where to go, and all day to get there). Hard to kill bugs at that speed.